If God (or this writer) had to select the most appropriate music for a crispy cloudless Manhattan autumn afternoon, with pigeons cooing and dogs jumping and babies smiling, well...it would have to be Luigi Boccherini’s C Major Quartet. So miracle of miracles, that was exactly how the young deft lyrical Quartetto di Cremona started their recital this afternoon at the Frick Museum. Not that I had heard that particular work previously. But every single work of Boccherini has that lithe ease, that balance of color and shade, of Iberian pictorialism (most of his creative life was in Spain) and Italian song. In fact, some years ago, rather than visiting Lucca for the churches of the Puccini family, this writer made a beeline to the house where Boccherini was born. Puccini came second. Yes, this was lightweight stuff, but to the Quartetto di Cremona, it was lifted up like a Raphael angel. True, the Quartet resides now in Genoa. But all four of them play Stradivariuses–and Cremona, with its unique forests, was where Stradivarius and his student made their great fiddles. The Quartetto di Cremona is not a Quartetto Italiano, which was at the top of the Western European chamber music pantheon until a few years ago. But the Quartetto di Cremona, created 18 years ago, is equally diverse (their complete Beethoven quartets was given rave reviews), has the same splendid technical prowess. And, perhaps because of their choices yesterday, their personalities are penetrate into all their music. The choices were 100 percent Italian (save for Hugo Wolf, whose Italian Serenade makes him an honorary citizen). While loath to say this, the satisfaction of all this music eschewed the depth and heavyweight quartet-playing of a Brahms or Beethoven. Yet in each work, the four players (three of them standing) showed the joy of lyricism at its finest. Yes, that Boccherini C Major Quartet was a short three movements, but each movement was special. The opening Allegro spirituoso could have been pleasant minor Mozart, save for some unexpected Spanish slashing of the fiddles at unexpected moments. The final Minuet was gossamer-thin, stopping just when it was starting. A bijou, a glistening bijou. Two contemporary short works followed. The 68-year-old Lorenzo Ferrero wrote a three-movement Tempi di Quartetto, the first movement dedicated to the memory of publisher-editor David Huntley. It was slow, yet never doleful. The melody was engaging, the performance a tribute to simple inspiration. The following Allegro had the rollicking six-eight meter of a square dance. A complicated square dance played with simple joy. Finally Slow Rock did not sound like any “rock” I ever heard. And while not minimalist, the modulations were definitely Philip Glass. Far more moody was 70-year-old Fabio Vacchi, whose Movimento di quartetto was the only sheerly emotional work on the program, varying from funereal to riotous, with a complicated structure, yet always accessible measures. The most familiar work on this first half was Hugo Wolf’s Italian Serenade. It popularity is perhaps due to quasi-schmaltzy tunes played with excess retards, coming unhappily close to Tchaikovsky’s similar work. The Quartetto di Cremona didn’t fall for that. Perhaps because they are Italian, perhaps because they are as much products of German-Austrian music as Italian, their was literal rather than light. Not that I was nonplussed by its relatively serious performance. In fact, where one usually feels like dancing, this time I realized just how wonderfully lyrical was Hugo Wolf, a post-Schubert melodist. That first half was unexpected and for the most part, showed four players with lovely colors. No excesses. (in fact the only solo legerdemain was First Violinist Cristiano Gualco’ solos in the final work, Verdi’s Quartet), simply splendid playing. The second half started with Giacomo Puccini’s Chrysanthemums, which he wrote in one night. While Puccini wrote more than operas (his religious music is very touching, giving due credit to his three generations of church composers), not even the Quartetto di Cremona could make this more than a short sentimental bagatelle. Never, though, saccharine. The Cremona artists played it with more aplomb than it deserved. The last work was Verdi’s only string quartet. He wrote it because he was bored. (His Aida premiere was postponed, and he was stuck in a hotel room with nothing to do.) Verdi never took it seriously, didn’t want it to be published, but modestly allowed a few friends to play it. 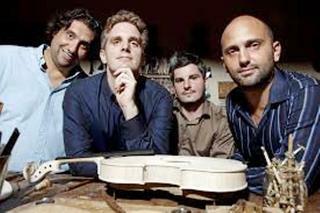 The Quartetto di Cremona had no problems with the first two movements, nor did we. It simply was comfortable. The third Prestissimo showed exactly how much power this ensemble has. They let it explode like a perpetuum mobile. But the finale was a tribute to Verdi himself. Offhand, I can recall only two of his fugues: one from Falstaff, the other the eight-part Sanctus from the Requiem. The last movement here was a fugue/scherzo and the most exciting music of the afternoon. Granted, all the work of the Quartetto di Cremona was splendid, but for those who think of Verdi as an operatic melodist, this finale showed a man–and a quartet–as masters of their craft. And for our sakes on this hallowed Fall afternoon, maestros of their art.